Yesterday’s Deseret News carried a very sad and sobering report: “Deadly taboo: Youth suicide an epidemic that many in Utah prefer to ignore.” The report relates the tragic stories of several Utah teens who have taken their own lives in recent months and talks in depth about the widespread problem of youth suicide in Utah. “A former surgeon general who recently spoke in Utah about suicide prevention said he was impressed with the state’s warm and friendly people, said Ken Tuttle, director of psychiatry at Utah Valley Regional Medical Center. But not only in Utah. 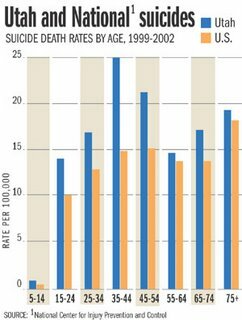 The article notes that the whole group of Rocky Mountain states has an unexplainable 30 percent higher rate of suicide than the rest of the U.S.
“Suicide is clearly a taboo subject. And to talk about youth suicide is to wade into the complicated, mysterious arena of mental health and the delicate world of teenage emotion. “This is a place few want to go. Indeed. I did a search of LDS Church magazines and curriculum for the past 10 years. I searched for the word “suicide” in General Conference reports, First Presidency messages, general women’s meetings, Visiting Teaching messages, and the words of all General Authorities and found no discussion of the topic whatsoever. I found only three instances where the word “suicide” was even mentioned, and all three were in passing, in talks on other subjects. It’s amazing to me that the leadership of the Mormon Church does not provide help and hope for those suffering from pain related to suicide. No wonder it’s thought to be a taboo subject that must be borne alone. The belief that nothing could help. The belief that seeking help is a sign of weakness or failure. The reluctance to admit to having mental health problems. The embarrassment about seeking help. Of course I realize that mental illness must overcome stigmas everywhere, not just in Utah. Yet in a state where well over half the population share a common and dedicated faith and pride themselves on the extraordinary way they care for one another, the hopelessness of Utah teens as they suffer in silence is hard to understand. This entry was posted in Mormon Culture and tagged Suicide. Bookmark the permalink.